The Department of Botany was started at graduate level in July 1966 with visiting faculty Shri R. S. Garg and Dr V Srivastava. Later in the next academic session Dr. Y.P.S. Pundir was appointed as Head of the department in July 1967 and Mr. Daya Adhin joined the department as Lecturer, in September 1967. Dr S.K. Agarwal and Dr. Mahesh Bhandari joined the department in July, 1971 and August, 1971 respectively and then Shri AK Mishra and Dr. P.K. Srivastava in September 1974. The University accorded the affiliation of post graduate clases in self finance mode in December 2001. Later in July 2008 Dr. Richa Srivastava Negi and Dr. A. 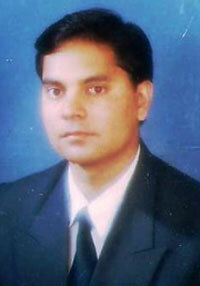 B. Bajpai joined the department as an Assistant Professor followed by Dr. Nirmala Koranga in January 2009. Dr Pornima Uniyal, Dr Neelam Negi and Dr. Vijay Laxmi Singh are the faculty members of the department under the self finance scheme. Dr. S. K. Agarwal took the charge, as head of the department in July 2006 and worked in the same capacity till retirement in June 2009. He was specialised in the field of “Taxonomy” and published a number of research papers in reputed “International and National Journals.” He is also a panel member of Research Journals. Dr. M. Bhandari was specialised in “Genetics and Plant Breeding.” He retired in June 2008. Shri A.K. Mishra associate professor and head of the department (since July 2009) was specialised in “Plant Pathology” Dr. P. K. Srivastava is the Associate Professor of the department.His field of research is “Ecology” and he has published a number of papers in national journals and national conferences. Dr. Richa Srivastava Negi has also worked for some years as assistant professor. She published two research papers in national journals. Dr. Atal Bihari Bajpai is an Assistant Professor and his field of research is “Plant Pathology”, he has in his credit a number of research papers. Dr. Nirmala Koranga is an Assistant Professor, her field of research is also “Plant Pathology” and she has also published a number of papers and has a attended a number of workshops, seminars & conferences and completed a major research project funded by the DST. Dr. Purnima Uniyal, Dr Neelam Negi and Dr Vijay Laxmi Singh are specialised in the field of “Plant Physiology, Ecology and Genetics and Plant breeding” respectively. They are involved in various research activities. The result of MSc Botany students is always excellent and a majority of the students generally score first division.